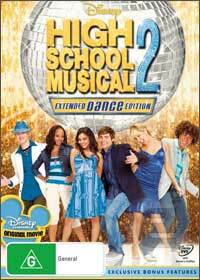 Before High School Musical 3 is released, fans of the series can now enjoy High School Musical 2: Extended Dance version which also contains a bonus 10 minutes of the upcoming movie. Sit back or dance as you watch the East High Wildcats get into a whole world of mischief as they dance and sing their way to the top. Although the plot is quite simplistic at times which involves Sharpay (Ashley Tisdale) attempting to lure Tory (Zac Efron) from his girlfriend Gabriella (Vanessa Hudgens), what makes this series so popular is the vibrant atmosphere of the title which features some of Hollywood’s best upcoming stars and starlets. Where this version does shine is through the special features which comes on its own disc and features a plethora of Wildcat specials. Featuring an interactive dance-along, a karaoke feature, this allows the viewer to get thoroughly immersed into the title. There are also some interesting rehearsal and deleted scenes plus music videos and a whole lot of High School Musical goodness. Even if you own the original, you’d be hard pressed not to buy the Extended Dance Edition due to the new content and the 10 minute glimpse of the upcoming movie. The video quality is quite impressive on this release with sharp images and vibrant picture quality that is complimented with amazing audio which sounds phenomenal through our Dolby Digital 5.1 surround sound setup. Definitely one for the fans or those who enjoy a light hearted movie about song and dance.